Skin/Fur/Scales, Etc. : Skin? hair? Ears? duh? A custom-outfit Airi wears, it does not inhibit movement and is based off original japanese Kimono, but changed for her constant work. Although not giving much protection, it does not break under normal usage. Made from a soft fabric, it is enchanted increasing her Cresent Magic abilities. Hobbies/skills: Cooking, House work, Getting men to fall for her (Unintentional), Tracking, Swordwork, medicines and doctor stuff. Did blacksmithing for a year until she stopped. Strengths: Her true strength lies in her mental capabilities. Her senses are heightened and she can see things more quickly than normal people. Her body movement is also elegant and quick. her beautiful body is also able to make men swoon. Gaia - A glowing red beautiful blade, this single-hand wielded sword, represents Strength and the Earth. The sword is heavier than its counterpart and packs more cutting strength than Skies. It also utilizes flames and roses in it's powers. The original special ability of this blade that it grows in strength and is more powerful when used in sunlight or radiation. Skies - A glowing elegant blue blade, This blade is also Single-hand wielded and represents Speed, accuracy and the Skies. The sword is lighter than Its counterpart and has more piercing capabilities and swings-per-minute than it's heavier counterpart. It utilizes Lighting and water in it's powers. The original ability of this blade is that it gets more powerful when used in darkness or the night. Temple of the Blossom Arts - Despite always wanting to help people, people always thought of her as the best possible house wife. She completely threw those expectations out and mentored under an ancient art called the Temple of Blossom Arts. Tapping into the power of the moon, She can use "Cresent Magic" which is a type of "Super-Magic", Allowing her to do several magic attacks such as make magic ninja stars and make white flames. Eye-Paralysis - Not used as often as Temple of the Blossom Arts, She can make eye-contact with the target and freeze them for as long as she want, up to 1 hour and 30 minutes. She regularly forgets this in-battle. 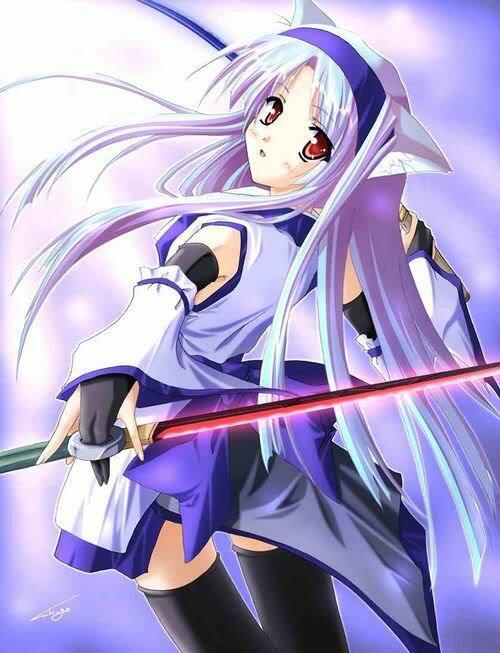 Attacks: Rose of the Moon - Surrounds her blades with a red aura and envelops the target before exploding in a white explosion. Combat style: She usually goes for elegant, swift strikes. Although she's also adapted her technique to counter-attack and not take any damage. She usually only uses one of her swords under normal circumstances as she does not want to hurt her friends but when pressed up and having no other options, she's almost double the abilities before when dual-Wielding. Personality: She's a cute sweet-heart. She's normally shy but opens up quickly. She also doubts her abilities and does not trust herself and will repeatedly say "Sorry" even when she did perfectly. She's also somewhat oblivious, having a mindset of a cat as well. She likes seeing smiles and will do almost anything to make people happy! She does not like blood and only fights as a very last option. She also likes taking care of people, and being proficient at it! Born unnaturally, Airi is born with cat genes (Roughly 40% of her genes are cats) and a unnaturally beautiful body, her village encouraged her to be the perfect girl she can be. Although after 9 years of doing housework, she wanted to try out blacksmithing but after another year, she stopped as her muscles gotten sore. She returned to housework for 3 years until she finally joined her village's Highschool and joined a combat-oriented club. Once she graduated at the age of 18, her village gave her Gaia and Skies (Red and Blue), blades of her bloodline,successfully continuing her parent's legacy. She then traveled across The Beyond, keeping in touch with her family. Re: Airi the Bright Neko! Oh yeah and uh... size down your profile picture..